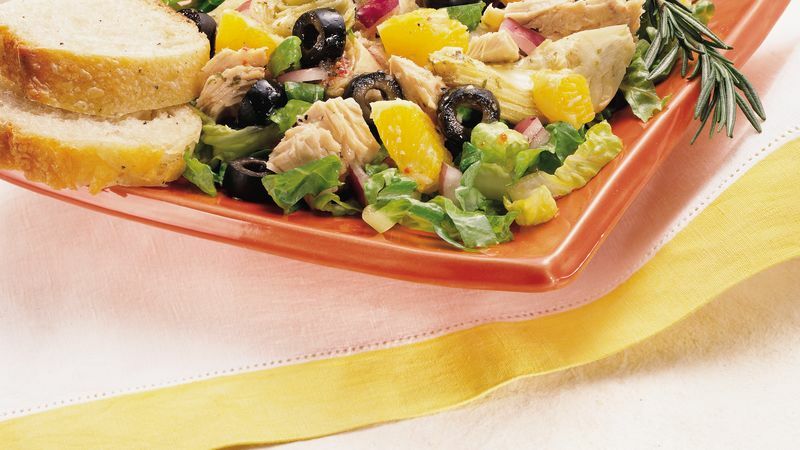 In medium bowl, combine tuna, artichoke hearts, olives, onion and orange; toss gently to mix. Arrange lettuce on serving platter; top with tuna mixture. Drizzle dressing over salad. Romaine is a lettuce believed to have come from Cos, an island in the Aegean Sea. The oblong head has dark green outer leaves and light green center leaves. Romaine has a crisp texture and a slightly bitter flavor. Garnish this salad with springs of fresh herbs such as rosemary, basil, thyme or parsley. Serve this European-style tuna salad with crusty bread and iced tea.